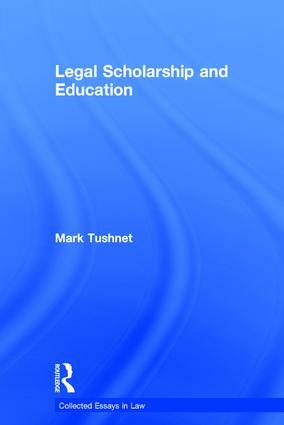 This book collects Mark Tushnet's essays on legal scholarship and legal education written between the 1970s and the end of the twentieth century. The essays deal with the development of critical legal studies and its current state, with persistent questions about the intellectual status of legal scholarship, with interdisciplinary legal scholarship (including law and economics), and with selected topics in legal pedagogy. Taken as a whole, the essays provide a good overview of Professor Tushnet's contributions to the intellectual history of legal scholarship and education in the United States. Contents: Introduction. Part 1 Critical Legal Studies: Introduction; Critical legal studies: an introduction to its origins and underpinnings; Introduction (Symposium on Frontiers of Legal Thought); Critical legal studies: a political history; Survey article: critical legal theory (without modifiers) in the United States. Part 2 Legal Scholarship in General: Post-realist legal scholarship; Legal scholarship: its causes and cure; Legal scholarship in the United States: an overview; Idols of the right: the 'law-and-economics' movement; Law, science, and law and economics; 'Everything old is new again': early reflections on the 'new Chicago school'; The death of an author, by himself; Interdisciplinary legal scholarship: the case of 'history-in-law'. Part 3 Constitutional Law Scholarship: Truth, justice and the American way: an interpretation of public law scholarship in the 70s; The future of constitutional law scholarship. Part 4 Pedagogy: Elite efforts to restrict the supply of lawyers: a comment on the Bok Report; Scenes from the metropolitan underground: a critical perspective on the status of clinical education; Evaluating students as preparation for the practice of law; An introduction (to Symposium: Academic Evaluation Focus); Name index. Each volume in this Collected Essays series brings together a selection of articles by a leading authority on a particular subject. The articles are drawn from a wide range of journals, conference proceedings and books. The collections make readily available the authors' own selections of their most important writings on specific themes, together with an introduction which outlines the context of the work and comments on its significance and potential. The collected essays complement each other to give a retrospective view of the author's achievements and a developmental picture of a subject area. Some volumes include critiques of the author's work which have called for a response and other contain previously unpublished essays on the selected subject.